Best Ideas for Kindle eBook Format. 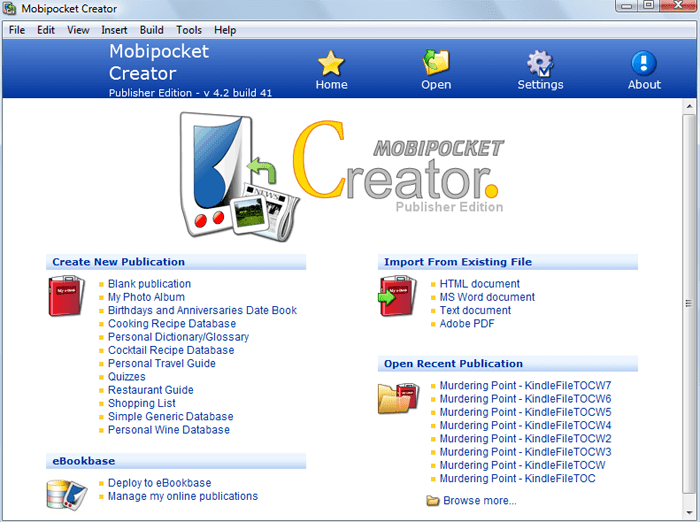 My Kindle eBook format process is all about Microsoft Word, and Mobipocket Creator. After playing with different formatting ideas and executing multiple Createspace content uploads, I’ve come up with the method giving me most control, and which gives me the best result. My method is to completely format my book in Word, then load the formatted word document into Mobipocket Creator. You can load your content directly into the Kindle system of course, but you will find that your Kindle eBook format won’t turn out exactly like you planned. The pages won’t break exactly where you want them too, the headings won’t be the size you thought, there won’t be gaps where you wanted gaps etc. The same will apply if you save your work as a PDF and load it or even if you go to the trouble of converting everything to HTML. And we all know that you just about need to be a tech-head to add a Table Of Content using Mobipocket alone. 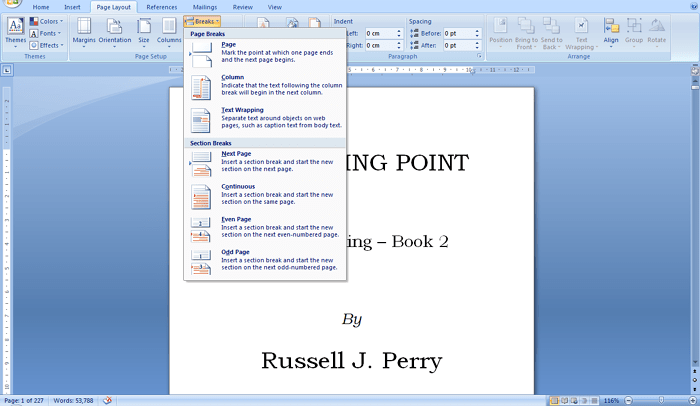 However when formatting in word, don’t leave it to the automatic formatting which occurs as you write. For formatting which will stick through the process, use the tools in “Page Layout” .. Below. To create the space you need between headings, place your cursor beneath the top heading and the next, and click “Continuous”. for extra wide space do this twice. This will work for anything you wish to create extra space between. Then to start your chapters on a new page, place your cursor after the last line of the previous chapter and click “Next page”. Although you can create your table of contents in Mobipocket. I defy anyone without advanced tech knowledge to work it out. And even then there is a lot of trial and error. If you do it in Word, it is easier and it will stick. You also have the control to place the links on the page where you want them. First you must format your chapter headings as “headings”. E.G. type in “Chapter 1”, then highlight it and click a style you would like from the toolbar at the top. When you have done all chapters go to “Insert” on the tool bar. 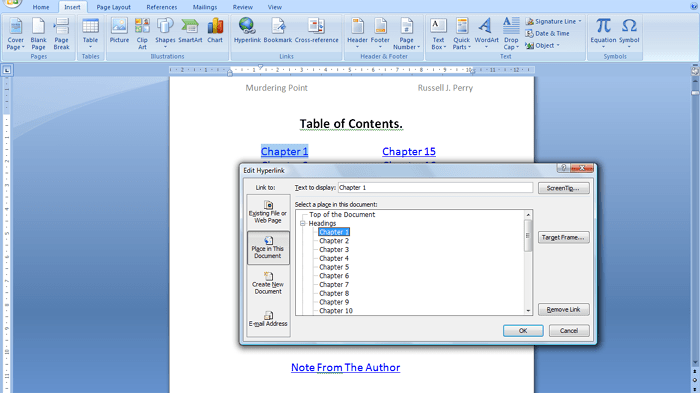 On the blank page where you want your TOC, type in the chapters you want, using the “tab” key if you want two columns. Highlight each chapter and click “Hyperlink” in the tool bar. In the pop up box you will see all headings you have created in you manuscript. Highlight them on your page and click the corresponding heading in the box. Your link is created and will holds its formatting in Mobipocket. Play around with your Kindle eBook formatting until you get it how you want it, then save. If you have some trial and error, save each try under a new name. For some unknown reason Mobi will use the original if you save to the same file name each time. It doesn’t recognize the changes. Go to “Import From Existing File” and click “MS word document”. Choose your file from where you saved it and click “Import” (Make sure you have closed your Word manuscript before you try to load.. Another Mobi quirk). If you haven’t already done so it is good to download Kindle for PC to your computer (Free) to check out your Kindle eBook Format. You can load you kindle file directly into your Kindle project. Comment below if I can help.